Meringue powder is an ingredient that you won’t see called for in recipes very often, but you will see if you browse the aisles of a baking supply store or a craft store with a cake decorating section. It also shows up on the ingredient lists of some packaged frostings and icing mixes.Â Meringue powder is a fine white powder made primarily from dried egg whites, with cornstarch to keep it from clumping while stored and some food gums to help it bind together easily when it is being used. The powder can be reconstituted with water and forms up into a nice, fluffy meringue when beaten at a high speed. 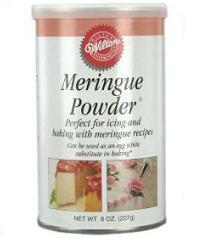 It is primarily used to make royal icing, as it adds a lot of stability to the frosting and a nice texture. The reason that it is used in royal icing is that many older recipes for the stiff icing called for raw egg whites and the meringue powder is a good substitution for them. Meringue powder can also be used as a substitute for egg whites in angel food cake (and often is, in some larger bakeries that offer… discount prices on their cakes). It works in that recipe because angel food cake really is just a meringue with a little bit of flour and flavoring added to it. Even though it works in these two recipes, meringue powder cannot be used as a substitute for egg whites in any recipe where egg whites are called for. It’s really just a substitution for egg whites that have been beaten to stiff peaks and will perform best in recipes that specifically look for that – like angel food cake and even some mousses. That being said, real eggs are always going to give you a better flavor in the finished product. Angel food cakes will be more moist and natural tasting when made with real egg whites (even though they’re actually not made when made with meringue powder), and if you choose to use the meringue powder in a mousse, it may have a starchy aftertaste from the cornstarch in the meringue powder. It is a useful ingredient – especially if you do a lot of cake decorating – but I would only use it in a pinch with a regular egg white based recipe and save the bulk of its use for frostings. Interesting. Glad you shared this information. While the original products are always best to use, we always need a “quick fix” every now and again. I will have to look for this next time I am at the store and give it a try! I don’t know how it happened, but I have a can of meringue powder in the cupboard. good to know all it’s uses other than hiding in the corner! How interesting. 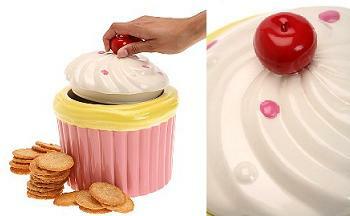 I never knew you could use it in angel food cake. I found a buttercream recipe that calls for meringue powder. Does that mean I can just use egg whites in place of it? How many whites if it calls for 1 Tbsp? I have whites sitting in a container in the freezer, so the volume amount would be great! Thanks for this post! Where can I buy Meringue Powder in Canada ? My mother used to use some, but I cannot seem to find it ? Or can I order some from you ? Can you use it on pies that need meringue? Can I crash ready made meringue and make them as a powder to use in the recipe ?